A recent UN inter-agency mission to the Central African Republic led by Humanitarian Coordinator Najat Rochdi went to Batangafo town, pictured here in the aftermath of a fire incident that completely burned an IDP site hosting over 27,000 people. People's needs in Central African Republic (CAR) have increased significantly in recent months, the top United Nations aid official in the country warned on Wednesday, amid worsening localized violence that has included the recent torching of two camps for displaced people. Speaking to journalists in Geneva, UN Humanitarian Coordinator Najat Rochdi urged the international community to help CAR, explaining that 2.9 million people in need of assistance and protection out of a total population of some 4.6 million "is a big deal". Next year, she said, 63 per cent of people there are likely to require urgent humanitarian assistance, up from 46 per cent in May. In the past three weeks alone, more than 50,000 people have been affected in Batafango town in Ouham prefecture, and in Alindao town in Basse Kotto prefecture, where assailants burned down two main sites for displaced people - a tactic never before seen in CAR. "The world cannot turn a blind eye to what is happening in the CAR. We are back to square one!" she said. "Everything was burned and (there is) a level of despair which is really heartbreaking," Ms. Rochdi said. "I went there, and I met with them and there is one thing they told me, all of them, is that they will never go back to the site. And therefore, it is really a lot of challenges for us when it comes to protection, but also when it comes to making sure they have a minimum living standard where they are." Fighting between the mostly Christian anti-Balaka militia and the mainly Muslim Séléka rebel coalition plunged CAR into civil conflict in 2012.A peace agreement was reached in January 2013, but rebels seized the capital, Bangui, two months later, forcing President François Bozizé to flee. 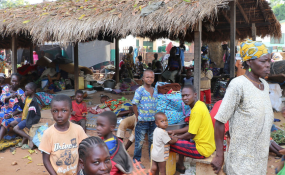 Concerned with the security, humanitarian, human rights and political crisis in the CAR and its regional implications, the Security Council authorized the deployment of a UN stabilization mission, known by its French acronym, MINUSCA, in 2014, with the protection of civilians as its utmost priority. While Ms. Rochdi acknowledged that the UN had taken on many functions of Government because of the crisis, she noted that in 2019, humanitarian priorities were likely to focus more on providing lifesaving help quickly via regional hubs and seeking to engage more with affected communities. "It is a conversation that has started," she said, adding that the fact that this year's $516 million CAR appeal was only 50 per cent funded meant that "realistic" decisions had to be taken about which communities to help. And highlighting the scattered nature of the violence in CAR - a country of huge natural wealth in the form of diamonds, gold and uranium - the UN official noted that there was good news in some areas, not least the spontaneous return of displaced people in the south-west.